Jonny Gray finished off a sensational team try to seal the bonus point for the Warriors. DTH van der Merwe tackled by Aled Summerhill. 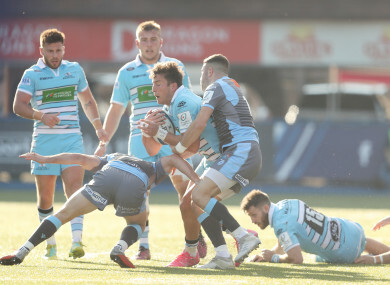 GLASGOW WARRIORS WENT some way towards making up for home defeat in round one by running in four tries to secure a 12-29 win in Cardiff. 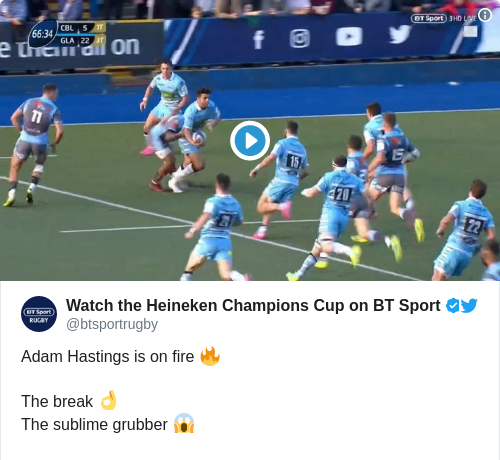 Dave Rennie’s side, playing in a confusingly similar shade of blue to their hosts, took a commanding lead early on with Adam Hastings and DTH van der Merwe crossing in the opening three minutes. A Hastings penalty helped the Warriors to a 0-15 lead at the interval and they continued pushing clear after the restart, Ali Price touching down before Aled Summerhill got the Blues on the board on 47 minutes. Warriors sealed the bonus point with a sensational sweeping move from their own five-metre line 13 minutes from time, the finish was supplied by Jonny Gray after the Scottish club put their full array of skills on show to pass, break and grubber their way through yards. Can’t see the clip above? Watch on Twitter. Job done and time enough only for Summerhill to claim a second consolation score before full-time. The five-pointer moves the Warriors one point ahead of Cardiff in Heineken Champions Cup pool 3 and keeps them in touch with Saracens after the English champions moved to nine points with victory over Lyon yesterday. Email “Glasgow a few shades better and claim bonus point win in Cardiff”. Feedback on “Glasgow a few shades better and claim bonus point win in Cardiff”.